Normally, I do not post two days in a row unless I am on vacation. However, I am finding I have a backlog of photographs I want to share so I hope you do not mind a couple more animal portraits of the avian variety. Peregrine Falcon (Falco peregrinus) photographed at Rosamond Gifford Zoo's Sunset Safari in Syracuse, New York on Tuesday, July 13, 2010. Nikon D70, 70-200VR, 1/100s, f/2.8, ISO 200, EV +0.6, 200mm focal length. Both of these photos were taken using the fabulous Nikon 70-200VR f/2.8 lens. Humboldt Penguin (Spheniscus humboldti) taken during the Sunset Safari evening at the Rosamond Gifford Zoo in Syracuse, New York on Tuesday, July 13, 2010. Nikon D70, 70-200VR, 1/250s, f/4, ISO 400, EV +0.6, 200mm focal length. 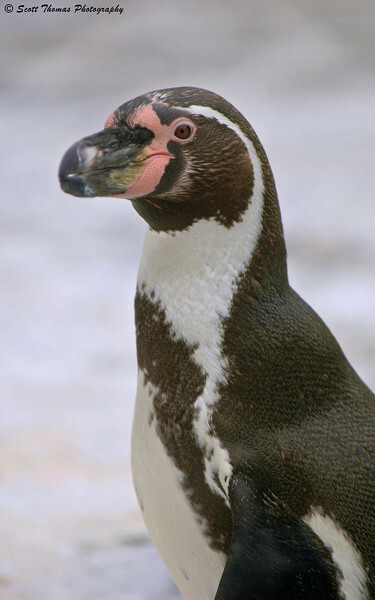 This entry was posted in Animals and tagged 70-200mm, birds, f/2.8, humboldt penguin, new york, nikon D70, peregrine falcon, Photography, portrait, rosamond gifford, syracuse, vr, zoo. Bookmark the permalink. Amazing eyes on the falcon, looking right at you! Awesome! Did it take many shots to actually get the one that you wanted? Adorable look on the penguin. A bird of prey, I’m thinking probably a peregrine since they are fairly common in this area, circles the neighborhood with its tell-tale cry on a regular basis. I keep wishing it would land somewhere in range of my camera! Good luck photographing one in the wild, Karen! Maybe you can find his favorite roosting place. Great bird shots, Scott! I have the 70-200 and love it, too! Thanks, Cindy! It is one sweet lens. Two lovely-looking birdies – Love the falcon, he’s a real pretty one. he looks like he just enjoyed a lovely lunch! Not sure if they had their dinner yet. Later, I photographed the Red-tailed Hawks (next door to the falcons) enjoying dinner. he’s got gunk on his beak, and a full crop, from what I can see, so I’m guessing he’s fed 🙂 Oh, Redtails, they are gorgeous birds! They are so beautiful, I love the eyes of the Peregrine Falcon. Thank you, Consuelo, they are amazing birds. I really love that peregrine falcon…you sense the power of the raptor. 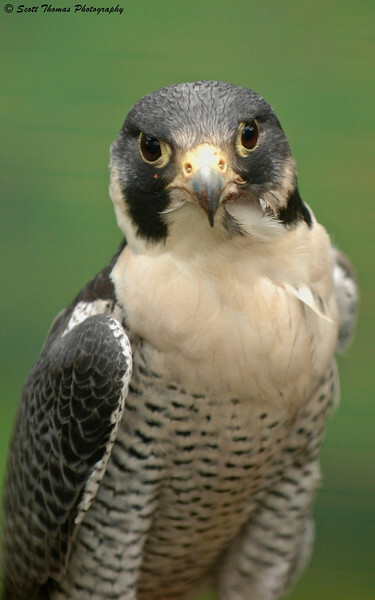 I read were Peregrine Falcons can reach speeds of 200mph when hunting as they dive into flocks of birds. Those are both great photos, Scott, but I especially like the one of the falcon. That shot is spectacular! That first shot is FANTASTIC! Such personality in that face! The falcon looks so serious. I wonder if he was posing or just caught unawares. That penguin was definitely posing to show his good side. I’m trying to figure out whether I read things into the portraits because of what I think I know about falcons and penguins or whether the ferocity and whimsy are there because, well, that’s how they are! Great images, Scott.